Ages ago, when I was utterly gripped by the fabulous first series of Danish crime drama The Killing, I desperately wanted my very own Jumper of Wisdom. 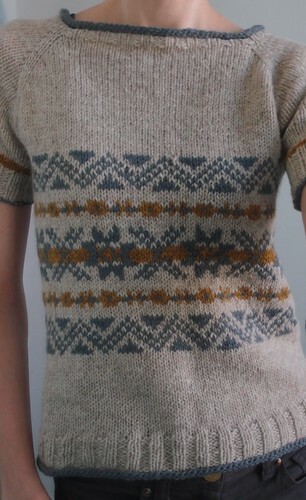 However, I didn’t want to make an exact replica, more of an ‘inspired by’ version of my own; a sheepy, fairisle jumper in which I could to fight crime, solve puzzles and run through badly lit basements, car parks and storage lockers. I ordered lots of wool from Jamiesons, set about swatching, came up with all sorts of exciting ideas, and even cast on a jumper – which then languished at the bottom of the WIP pile for the better part of a year. However, a few weeks ago, armed with my new copy of Mary Jane Mucklestone’s brilliant 200 Fair Isle Designs, I started again. This time, I opted for top down, instead of bottom up; I went up a couple of needle sizes for a looser gauge (and up another needle size for the fair isle, to stop my tension getting too tight); and then I winged it. I cast on, and did the neckline and basic raglan increases like I would for any simple jumper. Then once I split the sleeves, I picked out a pattern from the book and off I went. I didn’t map everything out, I didn’t have much of a plan, I just had fun with it. I didn’t do any waist shaping, and I just left two stitches at each side plain, so the pattern is broken in half, front and back. With a bit more planning, I could have made it a continuous loop around the body, but I was too impatient. The main snowflake is centred, but one thing I would change next time is to centre the other two patterns in line with it. Also, I didn’t have enough of the main colour to make it long sleeved. But considering it was a bit of a rush job, I’m really happy with how it turned out. It’s sort of a prototype for my real Jumper of Wisdom, but in the meantime I’d like to think Lund would approve. Well done, I love it! The grey edging, is that just garter stitch? Thanks! It’s three rows of stocking stitch, which then curls into a fake/inside-out i-cord edge. It’s stunning! Well done, you. brilliant! sounds like it was fun to knit – and gorgeous for a “prototype”! Really pretty. I’ve heard that the American version of The Killing might be coming back. I love that show. I sense a new designer in our midst! That makes 2 in a row. Great work. Congrats – I really like the colours you chose for the fair isle. Wonderful! You being slim really makes the jumper look ever better. I am very jealous. I would love to be that thin. I like your version better, though. But at least one picture suggests that there are cozies–for gun and torch–in the book to go along with the sweater. 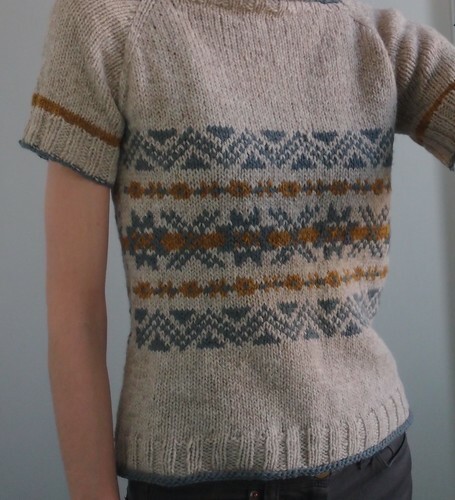 I also dream of knitting the sweaters from the American version of The Killing (see http://www.amctv.com/shows/the-killing/cast/sarah-linden & scroll down for some glimpses). The colors in the fair isle sweater would work well in our local alpaca yarns. Well done, it looks fantastic! All best wishes for a speedy recovery. You are designing BEAUTIFUL sweaters!